Shari Hite has always loved "thrifting." "I love thrifting! I only buy used clothing for my kids and for myself," she says. "You can find the same name-brand items used for much less than if you were to buy new." Plus, she always wanted to have a little clothing shop, so, it made sense for her to share her love of thriftiness and fashion with local ladies. 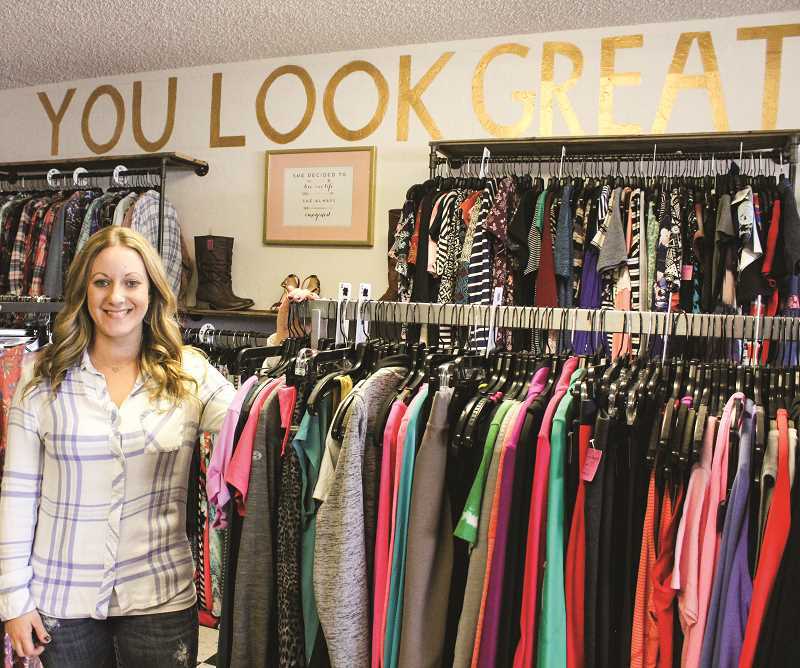 "I have always wanted to bring affordable fashion to Prineville for women," Hite said. She opened The Wild Rose Boutique on Sept. 1, 2017, but she says it's not your typical women's used clothing store. "Most everything is gently used. I handpick and clean everything that comes in here, and it's affordable," Hite said. "There are things from $1, shirts from $3, and the jeans start at $8, so very affordable. My Miss Me jeans are $18 — at other places, they're $100." She believes that Prineville has not fully recovered from the Great Recession. "There are a lot of families and women that still can't afford to shop, and I love being able to make women feel beautiful at an affordable price," Hite said. She has always been into fashion and enjoyed selling wholesale jewelry at fairs and bazaars, but she wanted to expand. "In January of 2017, I started collecting and buying clothing, buying store racks, buying hangers and then opened in September," she said. She wanted "Rose" to be part of her shop name in honor of her maternal grandmother and her daughter. "My grandmother's name was Rosalie, and on the side of her house were wild rose bushes everywhere," Hite recalls of the family farm in Cottage Grove. "I remember as a child going to the farm and picking all these beautiful wild roses and making bouquets. When we had our daughter, we named her Brianna Rose." She didn't want to include resale or thrift store in the name, so she chose "Boutique." "Boutique gives it this upscale feel, and I like that," Hite said. "I have the boutique style and the boutique quality but not at the boutique prices." She frequents thrift stores in Portland and even buys used clothing from individuals in that area and brings them back to her boutique. She says the quality of clothing is better in the big cities, and the prices are lower than this area. "By appointment, people can bring clothes in, and I go through it, pick what I want and offer them a price, and they walk out with cash," Hite said, adding that she is not a consignment store. "I look at quality and style — what the style is in Prineville right now." Aside from women's clothing, she also offers gently used shoes, purses and accessories. She sells new wholesale jewelry as well as sterling silver and turquoise jewelry that her father makes. Clothing that doesn't sell right away is put on a rack for 50 percent off. If it still does not sell, it goes to the $1 rack. From there, if clothing doesn't sell, Hite donates it to the Family Access Network. FAN provides free clothing to local students and their families. "Shari and The Wild Rose have been a great partnership for FAN," said Traci Peterson, a FAN advocate for Crook County High School, Crook County Middle School and Pioneer Alternative High School. "Her donations benefit those ages and their mothers." Peterson said she also uses Hite as a FAN resource to refer kids and families to her shop. "She is an asset to the community by offering nice clothing at a great price," Peterson said. Hite and her husband, who both grew up in Prineville, have three children, ages 14, 10 and 8. Shoppers may even see her children in the shop, helping at the till while she works in the back. She invites ladies to come into her shop for one-of-a-kind outfits. "Women can come in here and find jeans, shoes and a shirt for 20 bucks — a whole outfit, and it's not going to break their bank," Hite said. "I hear them when they walk out, 'Oh, my gosh, I love this place!' and I love that."